I am back with a HAPPY and cheerful post today. Just in time to really get excited for the week that lies ahead. 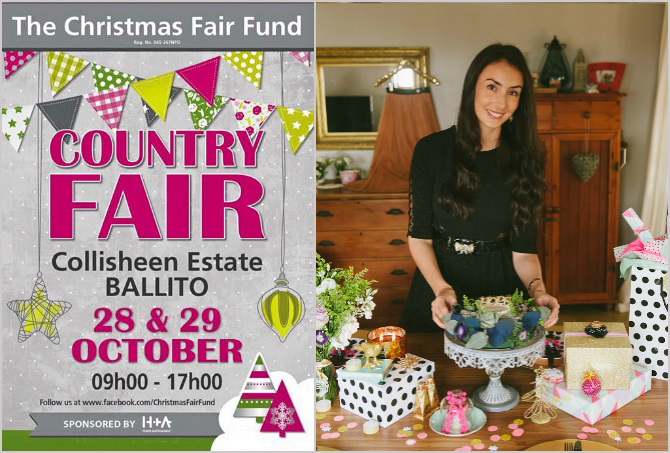 I am honoured to be hosting a demo at this year's Christmas Country Fair at Collisheen Estate next week Thursday 29 October. This annual event is lovingly organised by the Christmas Fair Fund - a group of volunteers who put the entire fair together. It's an NPO so the ladies work their hearts out to make the event a wonderful success and a merry blessing to those less fortunate! I will be sharing my insight and tips on wrapping and packaging, along with how to create a gifting experience. Giving gifts is one of my absolute passions and wrapping them is possibly one of my absolute favourite things. The demos are being hosted by a range of talented ladies including Patricia Lewis and Joani Mitchell. Tickets are very limited for the demo and are purchased prior to the event. To buy your ticket at R350 contact Michelle Blake via email (click here) or on 083 284 9059 / visit their Faceboook. Your ticket includes entrance to the fair (lots of beautiful things for sale), the demos, a shopping bag, bottle of water, glass of bubbly and a light snack. The morning kicks off around 8:30am on Thursday 29 October at Collisheen Estate. I was interviewed this morning on Life & Style fm and will check and see if I can share the link with here - should they have a recording. You can also see the feature here.